After returning from my trip of Cambodia, Vietnam and Malaysia in January, I promised myself that I would make a greater effort to learn about the history of Southeast Asia, and just cultural and country history in general. 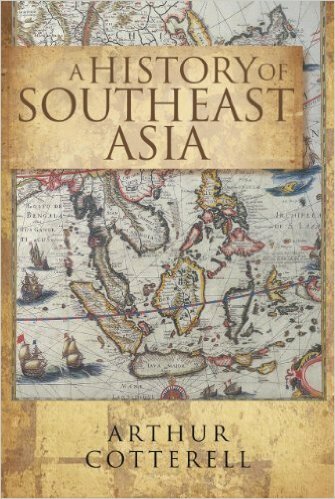 So I bought this fantastic book called A History Southeast Asia written by Arthur Cotterell. I am only at the Introduction (which summarises the whole book) but I have already learned so much!! I have decided to take down some notes as I go along so that I can remember what is going on. Southeast Asians are strongly influenced by 'spirit world worship' and indigenous spiritual beliefs, sometimes akin to black magic - known as "Bomo". China's impact on Vietnam caused France to call its colonial empire of Laos, Vietnam and Cambodia "Indochina". This area is, in a sense, a halfway point between what the author describes as 'secular' China (who mainly played a political role in the region) and 'religion-oriented' India (who was the main source of religious ideas). Buddhist monks travelling between India and China often stopped over the Straits of Malacca in Srivijaya (an old empire - see below). Most Southeast Asian people originate from China, specifically from what is now known as southern China near the Yangzi (Yangtze) delta. Population movements started around 3000BC - though at this time the Yangtze delta was not yet Chinese. China's alternate religion is Daoism/Taoism which embraces the spirit world. Ming China withdrew its navy from the South Oceans in the 1500's, giving the Europeans the false impression that the Europeans were the first to navigate the waters. Had they sailed in the 1420's rather than the 1490's, they may have bumped into Chinese fleets carrying 5x more than them. Eg. Cheng Ho/Zheng He was a sailing legend in the 1400's. When Malacca was captured by Portugal in 1511, by then China couldn't be bothered with the ocean, possibly because Beijing was now its new capital up north. Apparently another possible reason is that attention was being placed on securing the Great Wall of China around this time (So Southeast Asia had to fight the Colonial Powers on their own). India gave them Buddhism, but King Anathwrahta added indigenous spirit worship (nats) to make Buddhism more accessible. Pagan (aka Bagan) was a great centre of Buddhism learning. When Pagan was abandoned due to Mongol invasions, the Burmese revival began in Toungoo. Border disputes between India (British Empire) and Burma regarding North-Eastern India led to the first Anglo-Burmese war in 1824. They appear to have inherited Hinduism and Buddhism from India, but the caste system didn't transfer. Their kings were called devarajas, which came from Hinduism. The Mongol conquest of Nanzhou (Nanzhao, modern day Yunnan province in China) indirectly led to the fall of the Khmer - this increased the southern migration of Thais from Yunnan (Southern China). This, in turn, created patches of Thai groups that were difficult to unify, but eventually in 1351 the powerful Thai/Siam kingdom Ayutthaya (Ayudhya) was formed. This Thai kingdom would lead the kingdom of Angkor to its decline. The Thai made Angkor so threatened that their siege in 1431 caused Cambodia to shift its capital south to Lovek, and then Phnom Penh. Apparently the Dutch eventually pushed Portugal out of most of Southeast Asia. The European withdrawals were greatly propagated in 1945 when the British Labour Party was elected. The Labour Party believed in a Commonwealth of Free Nations - in contrast to the war approach adopted by the French and Dutch. Britain withdrew itself in an orderly way (eg granting India and Burma early independence), but the Dutch and French tried to hang onto their territory. See Srivijaya for ancient history. Gained independence from Holland in 1949. Military interference with the government since gaining independence in 1949 has plagued the country. Despite President Suharto's fall in 1998, it was not until 2004 that the first democratically elected president took office. Rainforests depleting at an alarming rate, like Malaysia. Although corruption has hindered its politics (as in Indonesia), it has done well in the post-colonial era but...it did need Commonwealth help when President Sukarno of Indonesia wanted to invade Malaysia in the 1960's. Rainforests depleting at an alarming rate, like Indonesia. Author opines that maritime Southeast Asia may fall into decline because of the replacement of forests with palm oil estates. Japan tried to exploit and conquer SE Asia with the Greater East Asia Co-Prosperity Sphere propaganda programme. Japan did not understand how the USA, the first peoples to escape from European colonialism, could try to restrain Japan from conquering Asia when the USA were colonising Asia themselves. Arguably this was a case of USA double standards? President William McKenly of the USA was happy to add Philippines and Guam as a means of fortifying the US's position in Asia (a rather weak one at the time apparently given aggressive Japan) - they were happy to add the anchorage at Luzon to the facilities just built in Pearl Harbour in newly annexed Hawaii. The destruction of Manila by the Japanese cast a shadow over their independence on 4 July 1946. Democracy has not been that successful and has had a rather chequered history (like Thailand and Myanmar). See Majahapit empire under Srivijaya for ancient history. Empire that included modern day Indonesia, Malaysia, Thailand, Singapore, Brunei in late 680AD to 1200AD++?. Ejected from Malaysia in 1965. Malaysian Prime Minister Tunkul Abdul Rahmen opined that this would avoid bloodshed between Chinese and Malays - there was bad blood regarding the positive discrimination (affirmative action) policies favouring the Malays. The Parliament of Malaysia voted 126-0 in favour of the expulsion. Chief Minister of Singapore, Lee Kuan Yew, did not want Singapore to be separated from Malaysia. Singapore proved the world wrong regarding its prospects of survival and has thrived like crazy. Lee Kuan Yew remarked that the younger generation of Singapore took for granted Singapore's affluence - all Singapore can do is "take the world as it is; [Singapore] is too small to change it." LKY in his book Hard Truths said that Singapore did not truly become independent until it had its own water supply (prior to that it had been getting water from Malaysia). Now a modern-city state dominating the region economically. In the 1400's or so, they really liked the culture of Angkor in Cambodia and borrowed it - The Khmer King Jayavarman integrated Buddhist concepts with the Hindu ideas of kingship. Like Korea, although Vietnam was impacted by Chinese culture, Vietnam did not lose its identity. One of the main reasons for this was its totally different language which, in a sense, offered a defence mechanism against the Chinese (they learned their native tongue in addition to the Chinese language). The Chams blocked the expansion of Vietnam until 1471, possibly because of their maritime language. The Chams moved to Indonesia and now speak 250 separate languages. Emperor Le Thanh Tong contributed much to Vietnam but his two sons caused disunity in the country (how?). From 1672- 1806, the Nguyen dynasty ruled the south from the river Hue while the Trinh Lords ruled north. France occupied Saigon in 1859 - prior to that, the Nguyen emperors who reunified Vietnam had a Chinese-style administration which apparently proved to be no fight for the French. The Vietnamese led a resistance against the French in the First Vietnamese War - this resulted in devastating losses for both sides especially once USA was involved. The Second Vietnamese War proved Washington's failure to understand that all Ho Chi Minh wanted was the unity of Vietnam. It's fun to be learning again.